The Caddo Nation was previously known as the Caddo Tribe of Oklahoma. The tribal constitution provides for election of an eight-person council, with a chairperson, that is based in Binger, Oklahoma. The tribe operates its own housing authority and issues its own tribal vehicle tags. It also operates an administrative center, dance grounds, several community centers, the Caddo Nation Heritage Museum, and an active NAGPRA office, located south of Binger. As of 2012, 5,757 people are enrolled in the nation, with 3,044 living within the state of Oklahoma. Individuals are required to document at least 1/16 Caddo ancestry in order to enroll as citizens. The tribe has several programs to invigorate Caddo culture. It sponsors a summer culture camp for children. The Hasinai Society and Caddo Culture Club both teach and perform Caddo songs and dances to keep the tradition alive and pass it on to the next generations. The Kiwat Hasinay Foundation is dedicated to preserving and increasing use of the Caddo language. The Caddo are thought to be an extension of Woodland period peoples, the Fourche Maline and Mossy Grove cultures, whose members were living in the area of Arkansas, Louisiana, Oklahoma, and Texas between 200 BCE and 800 CE. The Wichita and Pawnee are related to the Caddo, as both tribes speak Caddoan languages. By 800 CE, this society had begun to coalesce into the Caddoan Mississippian culture. Some villages began to gain prominence as ritual centers. Leaders directed the construction of major earthworks, serving as temple mounds and platforms for residences of the elite. The flat-topped mounds were arranged around leveled, large, open plazas, which were usually kept swept clean and were often used for ceremonial occasions. As complex religious and social ideas developed, some people and family lineages gained prominence over others. By 1000 CE, a society that is defined by archaeologists as "Caddoan" had emerged. By 1200, the many villages, hamlets, and farmsteads established throughout the Caddo world had developed extensive maize agriculture, producing a surplus that allowed for greater density of settlement. In these villages, artisans and craftsmen developed specialties. The artistic skills and earthwork mound-building of the Caddoan Mississippians flourished during the 12th and 13th centuries. The Spiro Mounds, near the Arkansas River in present-day southeastern Oklahoma, were some of the most elaborate mounds in the United States. They were made by Mississippian ancestors of the historic Caddo and Wichita tribes, in what is considered the westernmost point of the Mississippian culture. The Caddo were farmers and enjoyed good growing conditions most of the time. The Piney Woods, the geographic area where they lived, was affected by the Great Drought from 1276–1299 CE, which covered an area extending to present-day California and disrupted many Native American cultures. Archeological evidence has confirmed that the cultural continuity is unbroken from prehistory to the present among these peoples. 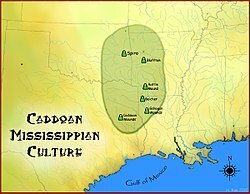 The Caddoan Mississippian people were the direct ancestors of the historic Caddo people and related Caddo-language speakers who encountered the first Europeans, as well as of the modern Caddo Nation of Oklahoma. Caddo oral history of their creation story says the tribe emerged from a cave, called Chahkanina or "the place of crying," located at the confluence of the Red River of the South and Mississippi River in northern present-day Louisiana. Their leader, named Moon, instructed the people not to look back. An old Caddo man carried with him a drum, a pipe, and fire, all of which have continued to be important religious items to the people. His wife carried corn and pumpkin seeds. As people and accompanying animals emerged, the wolf looked back. The exit from the underground closed to the remaining people and animals. The Caddo peoples moved west along the Red River, which they called Bah'hatteno in Caddo. A Caddo woman, Zacado, instructed the tribe in hunting, fishing, home construction, and making clothing. Caddo religion focuses on Kadhi háyuh, translating to "Lord Above" or "Lord of the Sky." In early times, the people were led by priests, including a head priest, the xinesi, who could commune with spirits residing near Caddo temples. A cycle of ceremonies developed around important periods of corn cultivation. Tobacco was and is used ceremonially. Early priests drank a purifying sacrament made of wild olive leaves. Centuries before extensive European contact, some of the Caddo territory was invaded by migrating Dhegihan-speaking peoples, Osage, Ponca, Omaha, and Kaw, who moved west beginning about 1200 due to years of warfare with the Iroquois in the Ohio River area of present-day Kentucky. The Iroquois took control of hunting grounds in the area. The Osage particularly fought the Caddo, pushed them out of some former territory, and became dominant in the region of present-day Missouri, Arkansas, and eastern Kansas. These tribes had become settled in their new territory west of the Mississippi prior to mid-18th-century European contact. Most of the Caddo historically lived in the Piney Woods ecoregion of the United States, divided among the state regions of East Texas, southern Arkansas, western Louisiana, and southeastern Oklahoma. This region extends up to the foothills of the Ozarks. The Piney Woods are a dense forest of deciduous and pinophyta flora covering rolling hills, steep river valleys, and intermittent wetlands called "bayous". Caddo people primarily settled near the Caddo River. When they first encountered Europeans and Africans, the Caddo tribes organized themselves in three confederacies: the Natchitoches, Hasinai, and Kadohadacho. They were loosely affiliated with other neighboring tribes including the Yowani a Choctaw band. The Natchitoches lived in now northern Louisiana, the Haisinai lived in East Texas, and the Kadohadacho lived near the border of Texas, Oklahoma, and Arkansas. The Caddo first encountered Europeans and Africans in 1541 when the Spanish Hernando de Soto Expedition came through their lands. De Soto's force had a violent clash with one band of Caddo Indians, the Tula people, near present-day Caddo Gap, Arkansas. This historic event has been marked by the modern town with a monument. French explorers in the early 18th century encountered the Natchitoche in northern Louisiana. They were followed by fur traders from outposts along the Gulf Coast, and later by missionaries from France and Spain, who also traveled among the people. The Europeans carried infections such as smallpox and measles, because these were endemic in their societies. As the Caddo peoples had no acquired immunity to such new diseases, they suffered epidemics with high fatalities that decimated the tribal populations. Influenza and malaria also devastated the Caddo. Having given way over years before the power of the former Ohio Valley tribes, the later Caddo negotiated for peace with the waves of Spanish, French, and finally Anglo-American settlers. After the 1803 Louisiana Purchase, by which the United States took over the former French colonial territory west of the Mississippi River, the US government sought to ally with the Caddo peoples. During the War of 1812, American generals such as William Henry Harrison, William Clark, and Andrew Jackson crushed pro-British uprisings among other Southeast Indians, in particular the Creeks. Due to the Caddo's neutrality and their importance as a source of information for the Louisiana Territory government, they were left alone. In the 1830s, the federal government embarked on a program of Indian removal of tribes from the Southeast in order to enable European-American settlement, as new migrants pressed from the east. In 1835 the Kadohadacho, the northernmost Caddo confederacy, signed a treaty with the US to relocate to independent Mexico (in the area of present-day East Texas). Then lightly settled by Mexican colonists, this area was being rapidly transformed by greatly increased immigration of European Americans. In 1836, the Anglo-Americans declared independence from Mexico and established the Republic of Texas, an independent nation. The name "Texas" is derived from the Hasinai word táysha, meaning "friend". On December 29, 1845, Texas was admitted to the US as a state. At that time, the federal government forced the relocation of both the Hasinai and the Kadohadacho as well as remnants of allied Delaware (Lenape) and Yowani onto the Brazos Reservation. Pressures increased on the Brazos Reservation Indians to remove north, culminating in a violent attack on December 26, 1858 on a Caddo encampment just off the reservation. This vigilante group led by Captain Peter Garland was a vigilante force from Erath County. The Caddo group was led by Choctaw Tom who was a Yowani Choctaw married to a Hasinai woman, who was killed in this fight along with twenty-seven other Indians. In 1859, many of the Caddo were relocated again to Indian Territory north of Texas, in present-day Oklahoma. After the Civil War, the Caddo were concentrated on a reservation located between the Washita and Canadian rivers in Indian Territory. In the late 19th century, the Caddo took up the Ghost Dance religion, which was widespread among American Indian nations in the West. John Wilson, a Caddo-Lenape medicine man who spoke only Caddo, was an influential leader in the Ghost Dance. In 1880, Wilson became a peyote roadman. 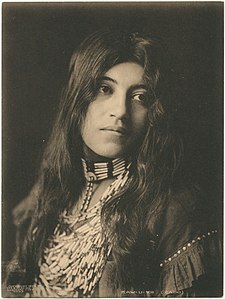 The tribe had known the Half Moon peyote ceremony, but Wilson introduced the Big Moon ceremony to them. The Caddo tribe remains very active in the Native American Church today. The Caddo vigorously opposed allotment. Whitebread, a Caddo leader, said, "because of their peaceful lives and friendship to the white man, and through their ignorance were not consulted, and have been ignored and stuck away in a corner and allowed to exist by sufferance." Tribal governments were dismantled at this time, and Native Americans were expected to act as state and US citizens. After some period, the adverse effects of these changes were recognized. The Caddo and other Native American peoples suffered greatly from the disruption of the loss of their lands and breakup of their traditional cultures. Under the federal Indian Reorganization Act of 1934 and the Oklahoma Indian Welfare Act of 1936, the Caddo restored their tribal government. They adopted a written constitution and a process of electing officials. They organized in 1938 as the Caddo Indian Tribe of Oklahoma. They ratified their constitution on 17 January 1938. In 1976, they drafted a new constitution, which continues elected representative government. During the 20th century, Caddo leaders such as Melford Williams, Harry Guy, Hubert Halfmoon, and Vernon Hunter have helped shape the tribe. In a special election on 29 June 2002, the tribe adopted six amendments to the constitution. Tribal enrollment is open to individuals with a documented minimum of 1/16 degree Caddo blood quantum. Sometimes, severe disagreements have developed among factions of the tribe that have not been resolved in elections. In August 2013, a group led by Philip Smith attempted to recall Brenda Shemayme Edwards, the chairman of the Tribal Council. This faction conducted a new election, but the victor stepped down, and Edwards refused to leave office. In October 2013, Smith and his supporters broke into the Caddo Nation headquarters. They chained the front doors from the inside and blocked off the entrance to the administration building. The opposition called the Bureau of Indian Affairs Police. Operation of the tribe was split between two factions. The Court of Indian Offenses, which had been overseeing issues for a year because of the internal conflict, in October 2014 ordered a new election for all positions. In the January 2015 elections, all the top tribal positions were won by women: Tamara Michele Francis as chair, Carol D. Ross as vice chair, Jennifer Reeder as secretary, and Wildena G. Moffer as treasurer. This page was last edited on 11 December 2018, at 16:02 (UTC).